Let's talk about the growing food delivery app trend. Why has it risen in popularity? Well, let's put it this way. When you have a 30 minute lunch you are going to look for, as GrubHub would say, simple, fast and convenient. When you are coming home after a long day of work you are going to eat what's simple, fast and convenient. 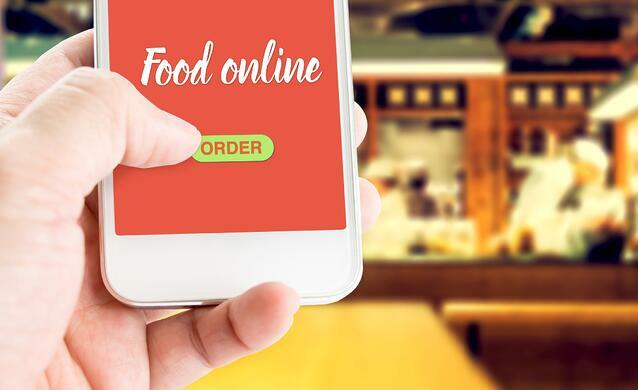 So, what these food ordering delivery companies have done is genius! They are a food delivery service that conveniently brings the food you ordered to your very own door or office. Now, don't get me wrong! These apps have a fair amount of great restaurants available, however, not every restaurant is featured. Why? Because it's the restaurants' duty to get on these apps. So, if you are one of the few restaurants that are not featured on a successful food delivery app, how on earth do you get on one? And how popular are these apps anyway? You're in luck, because I have the numbers and information just for you. You thought drive-thru was simple, fast and convenient? Well, wait till you get a load of just how successful these food delivery app companies have become. 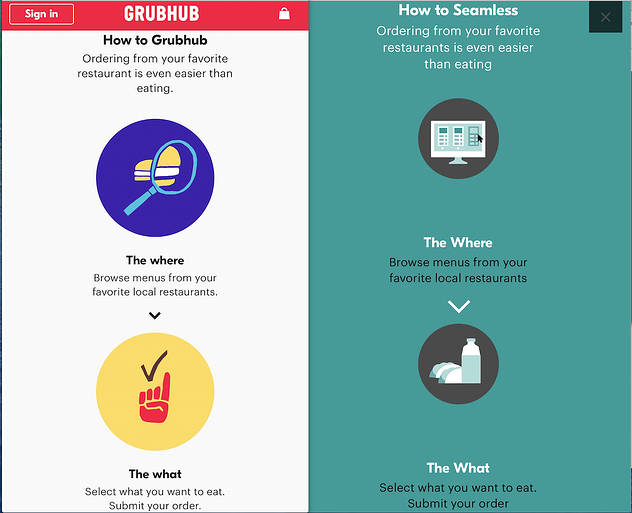 If you didn't already know, Seamless is a part of GrubHub Inc. which is probably why they share a similar interface as shown in the photo below. Both companies deliver for restaurants in more than 60 markets across the United States featuring over 45,000 restaurants on their site. Why should you consider GrubHub? Business is booming! For the quarter ended September 30, GrubHub reported that average daily orders grew 26 percent and gross food sales improved 33 percent to $735 million (Wall Street Journal). According to GrubHub, 90 percent of diners have been discovered on the site. Seamless has received 4 out of 5 stars in the app store being one of the top food delivery apps when entered in search. GrubHub and Seamless processed over 267,500 daily orders combined, representing 26 percent growth combined. GrubHub and Seamless controlled an estimated 59 percent of the market in 2015. Cost: On average restaurant owners pay around 13.5 percent commission on each order that is made through GrubHub. Keep in mind, GrubHub will charge restaurants a higher rate per order to rank high in search. 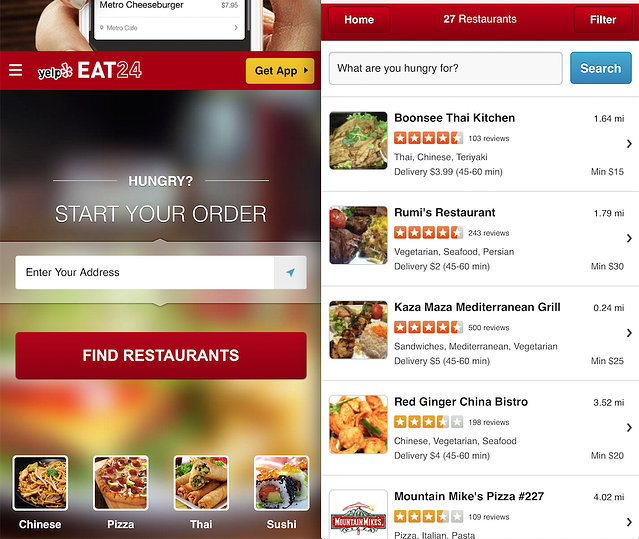 For you Yelpers out there, you might've noticed Eat24 is their sister company. Yelp introduced the food delivery service to the family when it purchased the company in 2013. Today, Eat24 has something to brag about. The food delivery app grew 33 percent year to year to $16 million (Nasdaq). Bookings through Eat24, Yelp reservations and Yelp platform, increased 39 percent year over year (Madison). According to Business Insider, GrubHub/Seamless and Eat24 appear to hold the strongest market value. How do you get on Eat24? Here's the link: https://eat24hours.com/join and you may contact their sales team via email: sales@eat24.com or contact their restaurant owner support toll free number at (877) 449-7090. Cost: Restaurant owners pay Eat24 a flat rate of 12.5 percent commission rate for each dish. 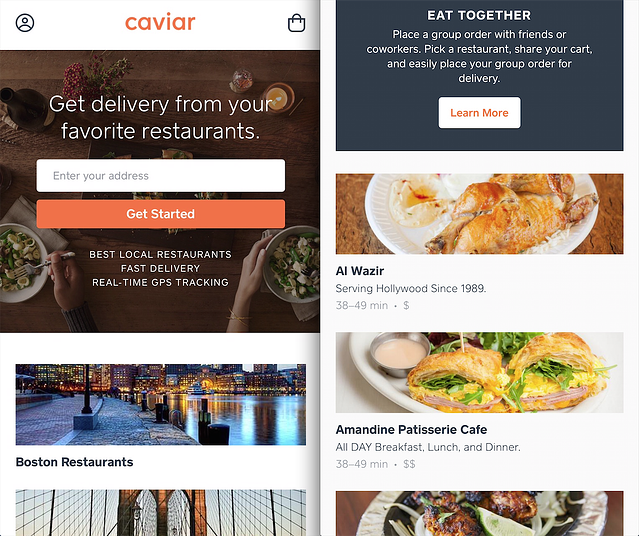 Similar to GrubHub and Seamless, Caviar is owned by Square. Starting with only 10 employees, Caviar has grown to well over 100 staff members today and is on its way to the top. This app is now available in 15 markets. Caviar's weekly order volume has grown 11-times since 2014 (Business Insider). It's drawing in the largest Square customers with an average annualized gross payments volume of over $500,000. How to get on Caviar? First, make sure Caviar covers your area as it has yet to service as many cities as other food delivery apps. Visit their "For Restaurants" page to read up on FAQs and other information. To get in contact with a Caviar representative click on "Get Started" and enter your information. There are over 10 mobile food delivery ordering apps out there. There are plenty to choose from. However, you want to make sure you are on the best food ordering delivery app. It's a perfect excuse to gain exposure and boost your restaurant marketing. This is one trend you do not want to miss out on. Remember, you want to be sure to keep up with today's trends and the food ordering apps is a big one. Also learn more about Menu Design here and our Menu Analysis Worksheet!